Interleukin-4, which has been contemplated for the treatment of rheumatoid arthritis and/or osteoarthritis because of its anticatabolic properties, has also been shown to modulate apoptosis. Because inadequate apoptosis is thought to contribute to synovial hyperplasia, we have investigated the ability of IL-4 and other Th2 cytokines to protect human synovial cells from apoptosis. Human synoviocytes or synovial explants were pretreated with IL-4, IL-10, and IL-13 before exposure to NO donor sodium-nitro-prusside (SNP). Apoptosis was evaluated by microscopy, annexin V-FITC, 3-(4,5-dimethylthiazol-2-gl)-5-(3-carboxymethoxylphenyl)-2-(4-sulphophenyl-2H tetrazolium inner salt (MTS) test, pulse field gel electrophoresis, and a method proposed in this study based on 32P Klenow end labeling of high m.w. DNA. Pretreatment by IL-4 or IL-13, but not IL-10, protected human synoviocytes from apoptosis induced by SNP. Even at doses as high as 2 mM SNP, up to 86% and 56% protection was achieved, after IL-4 and IL-13 treatment, respectively. Cell survival was dependent on IL concentration. IL-4 and IL-13 also had antiapoptotic effects on SNP-treated human synovial explants. Effects of IL-4 and IL-13 varied in the presence of phosphatidylinositol-3 kinase and protein kinase C inhibitors, implying the involvement of these pathways in antiapoptotic signaling. Antiapoptotic effects were dramatically inhibited by LY294002, and partially by the protein kinase C inhibitor Gö 6976, while insulin-like growth factor increased synoviocyte survival. The possibility that IL-4 and IL-13 may enhance synovial expansion in vivo by their antiapoptotic effects is discussed. Rheumatoid arthritis (RA)4 is an autoimmune disease characterized by hyperplasia of the synovium and cartilage destruction. Proliferation of the synovium is associated with increased production of proinflammatory cytokines, including IL-1 and TNF-α, which play a crucial role in cartilage degradation through their inducing effects on matrix metalloproteinases. IL-4 is able to suppress detrimental effects of IL-1 and TNF-α by stimulating IL-1Ra production (1), and down-regulating TNF receptor (2), transcription of metalloproteinases (3), and synoviocyte proliferation (4). These effects could be exploited in the treatment of RA and/or osteoarthritis (OA). In vivo, however, preliminary human studies in RA patients proved disappointing. Interestingly, studies on animal models of RA showed that IL-4 treatment protects cartilage destruction, but does not reduce synovial expansion and inflammation (5, 6, 7, 8, 9). Furthermore, synovial hyperplasia is even enhanced after IL-4 treatment (7, 9). Synovial hyperplasia is thought to be due, at least in part, to inadequate apoptosis (10). The synovial expansion induced by local IL-4 treatment might well be due to an antiapoptotic effect on synoviocytes because IL-4, through its α receptor (IL-4Rα), prevents apoptosis of different cell types (11, 12). In this work, we tested the ability of IL-4 to protect human synoviocytes or synovial explants from apoptosis induced by the NO donor sodium-nitro-prusside (SNP). NO was chosen as a proapoptotic agent due to its overproduction in RA joint, and its ability to induce apoptosis of human synoviocytes in vitro (10, 13). Synovial membranes were obtained from OA and RA patients during joint replacement. Normal synovial cells were obtained during joint replacement for hip fracture. Isolated cells (passages 2–4), or synovial explants of 7–8 mm3 were used in experiments. For cell isolation, synovium was finely cut and digested with collagenase, as previously described (14). Isolated cells were maintained in Dulbecco’s medium supplemented with 10% FCS (Life Technologies, Grand Island, NY). Thirteen OA patients were receiving only nonsteroidal antiinflammatory drugs and/or acetaminophen. Three patients with RA were receiving Methotrexate (one patient) or Methotrexate plus Hydroxychloroquine (two patients). Results obtained with RA synoviocytes, however, did not appear to be different from those obtained with OA synoviocytes. The NO donor, SNP, was chosen as a proapoptotic agent because of its ability to induce apoptosis in synoviocytes (10, 13). Synoviocytes or synovial explants were cultured in Dulbecco’s medium supplemented with 1–5% FCS. After preincubation with IL-4 (Genzyme, Cambridge, MA, and R&D Systems, Minneapolis, MN), IL-10, or IL-13 (PeproTech, Rocky Hill, NJ) for 48 h, cells or tissues were treated for an additional 24 h with SNP (Sigma-Aldrich, St. Louis, MO). In some experiments, wortmannin (Sigma-Aldrich), LY 294002, bisindolylmaleimide I, Gö 6983, Gö 6976 (Calbiochem, La Jolla, Ca), and insulin-like growth factor (IGF)-1 (R&D Systems) were added alone or concomitantly with ILs, during pretreatment. A total of 104 synoviocytes in 0.4 ml of medium were seeded in eight-well chamber slides (Nalge Nunc International, Naperville, IL). Cells were fixed 15 min in 3.7% paraformaldehyde, and washed with PBS. Staining of the cells was done with 4′,6-diamidino-2-phenylindole (DAPI) and propidium iodide for 15 min, simultaneously. After washing of the cells with PBS, cover slips were mounted on chamber slides by Fluoprep (Bio Mérieux SA, Marcy l’Etoile, France), and cells were observed with a fluorescence microscope. Apoptotic cells were readily recognized, as they had a condensed or fragmented nucleus. 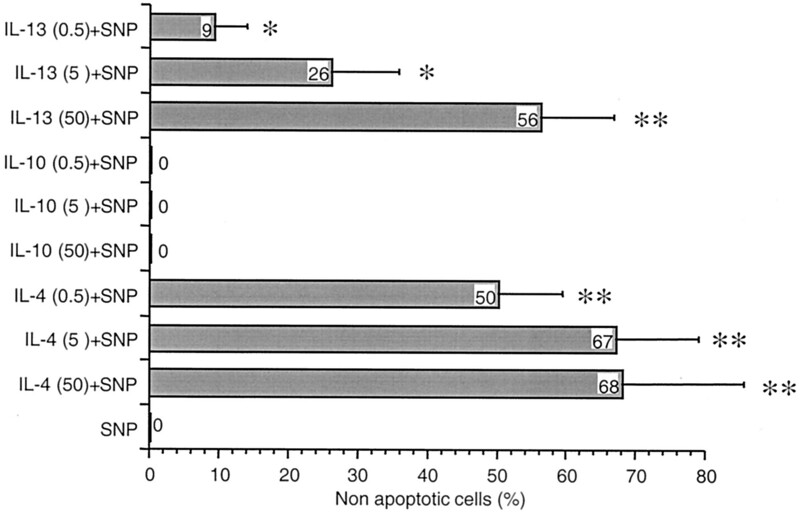 Percentage of nonapoptotic cells was calculated as the average number from duplicate cell cultures, each counted from five microscope fields (60–80 cells), and expressed as percentage in relation to the number of control cells (100%). Phosphatidylserine (PS) residues on cell surface were detected by annexin-V binding, as an index of apoptosis (15, 16). Cells exposed to IL-4 for 48 h and treated with SNP for an additional 2 or 24 h were removed from culture dishes with trypsin/EDTA. After a rinsing step with PBS containing 2% of BSA, PS were detected by labeling with annexin V-FITC (0.5 μg/ml) according to the manufacturer’s instructions (TACS annexin V-FITC apoptosis detection kit; R&D Systems). Cells were then analyzed by flow cytometry on a FACScan (Becton Dickinson, Mountain View, CA). Results were integrated with the CellQuest software (Becton Dickinson) and expressed as percentage of annexin V-positive cells in typical histogram profiles. U937 monocytic cell line was used as a positive control for apoptotic cell death. Apoptosis in U937 was induced with the proapoptotic agent, camptothecin (Sigma-Aldrich), used at 10 μg/ml for 4 h.
Cell survival was measured as mitochondrial NADH/NADPH-dependent dehydrogenase activity, resulting in the cellular conversion of the tetrazolium salt MTS into a soluble formazan dye (17). Briefly, cells were seeded in 96-well plate at the concentration of 5000/200 μl well. For induction of Fas-mediated apoptosis, 4 × 104 cells/200 μl of medium were used. After treatments, 40 μl of MTS solution (Promega, Madison, WI) was added in each well for 2–3 h. Finally, colorimetric measurement of formazan dye was performed on a spectrophotometer with an OD reading at 490 nm (17). Total DNA of human primary synoviocytes was isolated and labeled with Laddering-isotopic kit from R&D Systems, using Klenow enzyme and the [α-32P]dCTP or [α-32P]dATP (Hartmann Analytic, Braunschweig, Germany). One microgram of labeled DNA was electrophoresed on 0.6%–1% Trevis agarose gel in 1× Tris acetate EDTA. Gels were fixed in 10% acetic acid for 1 h at 4°C, vacuum dried, and exposed either to x-ray films for 10–30 min and/or a phosphor imaging cassette. Intensity of signals was calculated by densitometry, using Molecular Analyst software from Bio-Rad (Hercules, CA), or by a model 425 PhosphorImager (Molecular Dynamics, Sunnyvale, CA), using ImageQuant software. 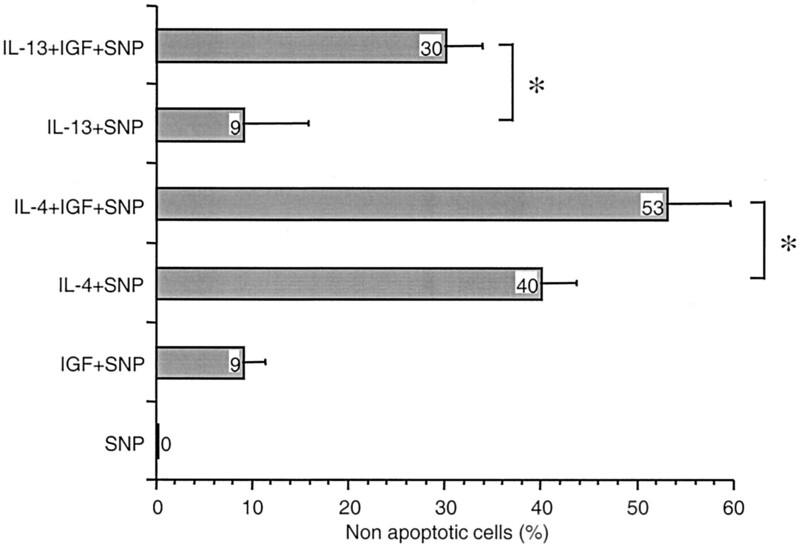 Relative percentage of apoptosis was calculated in relation to the value obtained by SNP treatment (100%). DNA from synovial explants was extracted by phenol, after 24-h digestion of minced frozen tissue with 100 mM NaCl, 10 mM Tris-Cl, pH 8, 25 mM EDTA, pH 8, 0.5% SDS, and 0.2 mg/ml proteinase K (Boehringer Mannheim, Indianapolis, IN) at 50°C. End labeling of DNA and electrophoresis were done as explained above. Synoviocytes were harvested by trypsinization, washed with PBS, and embedded in 1% low melting agarose in lysis buffer (20 mM NaCl, 100 mM EDTA, 10 mM Tris, pH 7.5). Solidified agarose plugs were incubated overnight in lysis buffer supplemented with 1% sarcosyl and 1 mg/ml of proteinase K, at 50°C. Plugs were dialyzed for 48 h in 50 mM EDTA, 10 mM Tris, pH 8, at 4°C. Gels (1.5%) prepared in 0.5× TBE, using the pulse field certificated agarose (Bio-Rad), were loaded with agarose plug pieces, each containing 0.5 × 106 cells. Electrophoresis was conducted in prechilled (10°C) 0.5× Tris borate EDTA buffer, at 200 V. The switch time was ramped from 50 to 90 s for 21 h. DNA size standard (0.05–1 Mb) was Lambda Ladder (Bio-Rad). Gels were stained in 0.5× Tris borate EDTA buffer with ethidium bromide (1.5 μg/ml) for 30 min at 4°C, and photographed. Gels were depurinated in 0.25 M HCl for 30 min, and then denaturated in 0.5 M NaOH, 1.5 M NaCl. Following neutralization in 0.5 M Tris, 1.5 M NaCl, pH 7, the transfer of DNA to ζ-Probe GT nylon membrane (Bio-Rad) was done overnight through capillary action using 10× SSC. Blotted membranes were exposed to 80°C for 30 min. Hybridization was done at 65°C for 24 h in 0.25 M sodium phosphate, pH 7.2, containing 7% SDS with addition of [α-32P]dCTP-labeled Cot-1 human DNA (Boehringer Mannheim), enriched in repetitive sequences. Membranes were washed twice for 15 min in 20 mM sodium phosphate, pH 7.2, 1% SDS at 65°C, and then exposed to x-ray films for 24–72 h.
Values of p were obtained using the Mann-Whitney test and considered significant when lower than 0.05. Apoptosis of human synoviocytes was induced by the NO donor SNP. Following exposure to 2 mM SNP for 24 h, no cells survived (Fig. 1⇓) and morphology of the cells showed a chromatin condensation characteristic of apoptosis (Fig. 1⇓C). However, when cells were pretreated by IL-4, 65–86% of them were protected, based on microscopic quantification of nonapoptotic cells (Fig. 1⇓, D and E). To confirm the proapoptotic effects of SNP and the protective effects of IL-4, apoptosis was also evaluated by measurement of PS exposure with annexin V-FITC (Fig. 2⇓). Likewise, SNP induced a strong increase of annexin V-positive apoptotic cells (20% at 2 h and more than 60% at 24 h), which was nearly completely blocked by IL-4. Comparable degrees of IL-4-mediated protection from SNP-induced apoptosis were obtained when cell survival was measured by MTS colorimetric assay (Fig. 3⇓, A and B). Dose-response analyses performed by both assays showed that the lowest concentrations inducing complete apoptosis of human synovial cells, within 24 h, usually ranged between 1 and 2 mM, and that antiapoptotic effect of IL-4 was similar for OA (Figs. 1⇓E and 3A), RA (Figs. 1⇓E and 3B), and normal synoviocytes (data not shown). These results also suggest that medications used in RA do not influence the effects of IL-4. 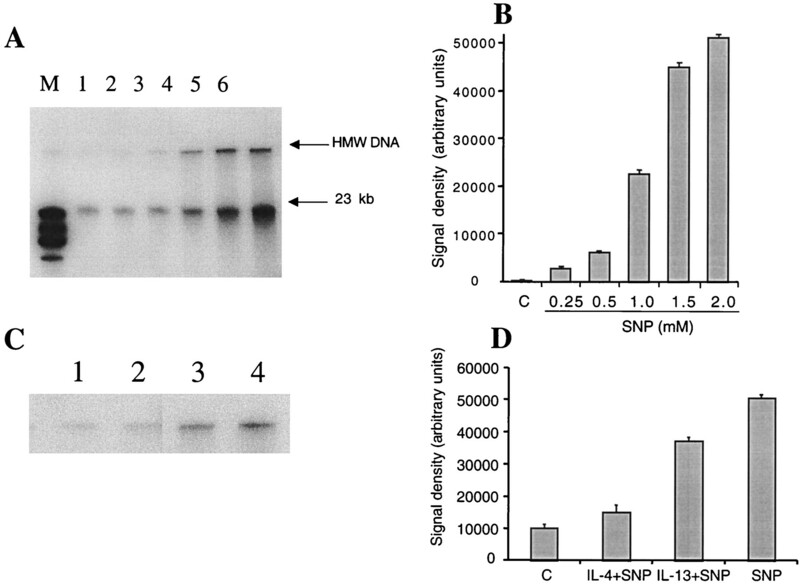 Effect of IL-4 on SNP-induced apoptosis of human synoviocytes. Isolated human synoviocytes, passage 2, were pretreated or not with IL-4 (50 ng/ml) for 48 h; SNP (2 mM) was then added for an additional 24 h. After SNP treatment, cells were fixed, stained with 4′,6-diamidino-2-phenylindole (DAPI)/propidium iodide, and photographed. A, Control, untreated cells. B, IL-4. C, SNP. D, IL-4 pretreatment, followed by SNP. Results are representative of at least three experiments with OA synoviocytes, three with RA synoviocytes, and two with normal synoviocytes. Presented experiment was performed with OA synoviocytes. E, Percentage of nonapoptotic cells was calculated as the average number from duplicate cell cultures, each counted from five microscopic fields and expressed as percentage in relation to the number of control cells (100%). The results of three independent experiments are presented. Experiment 1, RA synoviocytes, passage 3; experiment 2, OA synoviocytes, passage 2; experiment 3, OA synoviocytes, passage 3; experiment 4, OA synoviocytes, passage 3. ∗, p < 0.0005 as compared with the respective SNP-treated groups. 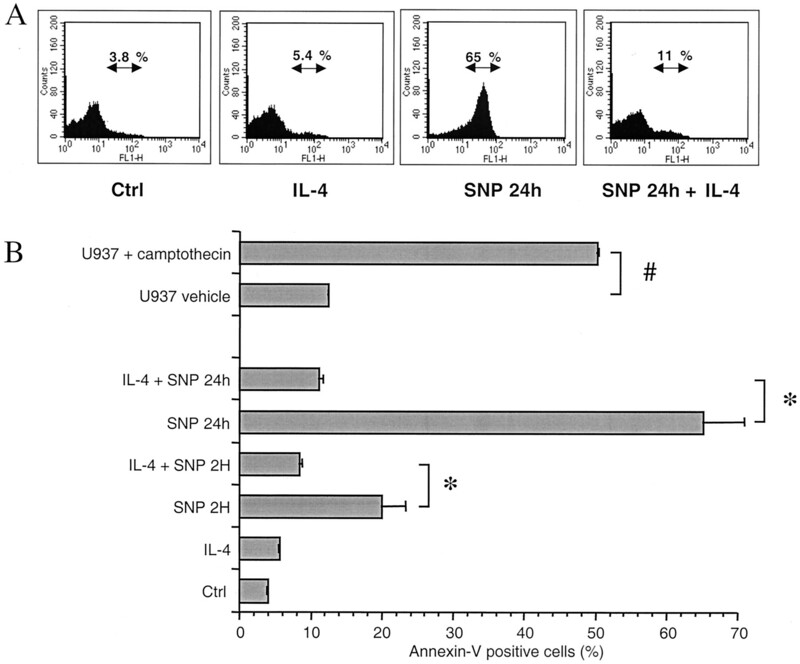 Effect of IL-4 on SNP-induced annexin V binding by human synoviocytes. Isolated human OA synoviocytes, passage 2, were pretreated or not (Ctrl) with IL-4 (50 ng/ml) for 48 h; SNP (2 mM) was then added for an additional 2 or 24 h, as indicated. After SNP treatment, apoptotic cell death was analyzed by annexin V staining, as described in Materials and Methods. A, Typical histogram profiles obtained in a representative experiment. Arrows indicate annexin V-FITC-positive cells, and numbers the percentage of apoptotic cells in each condition, as indicated below each profile. FL1-H, annexin-V-FITC fluorescence intensity. B, Time course study of IL-4 effects. Values correspond to the percentage of annexin V-FITC-positive cells in triplicate cultures, and error bars to the SDs. U937, used as positive control, were treated (vehicle + camptothecin) or not (vehicle) with the proapoptotic agent camptothecin. ∗, p < 0.001 as compared with the respective SNP-treated groups in absence of IL-4. #, p < 0.0005 as compared with the respective vehicle-treated cells. Quantification of IL-4 effect on cell survival by MTS assay. Cells were pretreated or not with IL-4 (50 ng/ml) for 48 h; SNP (0.75, 1, 1.5, or 2 mM) was then added for an additional 24 h. Following the SNP treatment, MTS assay was performed. Values correspond to the relative quantity (OD measured by spectrophotometry at 490 nm) of formazan produced in the triplicate culture supernatants, and error bars to the SDs. A, Experiment done with OA synoviocytes, passage 3; B, experiment done with RA synoviocytes, passage 3. ∗, p < 0.01 as compared with the respective SNP-treated groups in absence of IL-4. IL-4 antiapoptotic effect was further confirmed by PFGE (Fig. 4⇓). The DNA from SNP-treated cells was fragmented into high m.w. (HMW) fragments (Fig. 4⇓A, line 2). Such HMW DNA fragments, usually ranging from 30 kb to 1 mbp, found in all tested apoptotic cells, are considered an essential sign of apoptosis (18, 19, 20, 21). Accumulation of 30- to 50-kb DNA fragments is a characteristic pattern of detached apoptotic cells, especially in cell lines in which DNA laddering does not occur (20). DNA from SNP-treated synoviocytes indeed showed an accumulation of fragments around 50 kb (Fig. 4⇓A, line 2). Pretreatment of synoviocytes with IL-4 before SNP exposure prevented or dramatically diminished DNA fragmentation (Fig. 4⇓A, line 3). PFGE of DNA of human synoviocytes after IL-4 and/or SNP treatment. Isolated human OA primary synoviocytes, passage 4, were pretreated or not with IL-4 (50 ng/ml) for 48 h; SNP (2 mM) was then added for an additional 24 h. Following the SNP treatment, cells were collected in agarose plugs and DNA fragments were separated by PFGE: line 1, control; line 2, SNP; line 3, IL-4 + SNP; line 4, IL-4; line M, 0.05–1 Mb Lambda Ladder. A, Radiography of the blotted gel. Hybridization was performed with human genomic DNA, enriched in repetitive sequences. Accumulation of 50-kb range HMW fragments in apoptotic DNA is shown by the arrow. B, Ethidium bromide-stained gel showing the DNA m.w. marker. Figures are representative of three experiments (two with OA synoviocytes and one with normal synoviocytes with consistent results). The effects of IL-13 and IL-10, two other Th2 cytokines, were analyzed in additional experiments. IL-13 and IL-4, due to shared receptors, are known to overlap in several biological functions. Indeed, the effects of high doses of IL-13 were comparable with those of IL-4 (Fig. 5⇓). However, at lower concentrations (5 and 0.5 ng/ml), IL-13 protection was lower compared with that obtained with IL-4 (26% vs 67%, and 9% vs 50%, respectively). In contrast, IL-10 did not show any protective effect against NO-induced apoptosis, even at concentrations as high as 50 ng/ml. 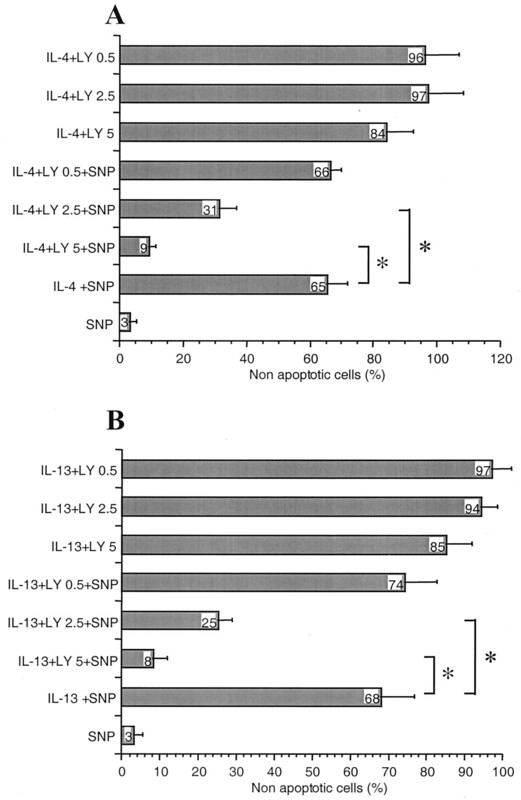 Effect of IL-13 and IL-10 on SNP-induced synoviocyte apoptosis. Isolated human OA synoviocytes, passage 2, were pretreated or not with 50, 5, or 0.5 ng/ml of IL-4, IL-10, or IL-13 for 48 h; SNP (2 mM) was then added for an additional 24 h. Following SNP treatment, the cells were fixed, and the percentage of nonapoptotic cells was quantified. Values correspond to duplicate cultures, each evaluated in five different microscopic fields, and the error bars to the SDs. Results are representative of two experiments. 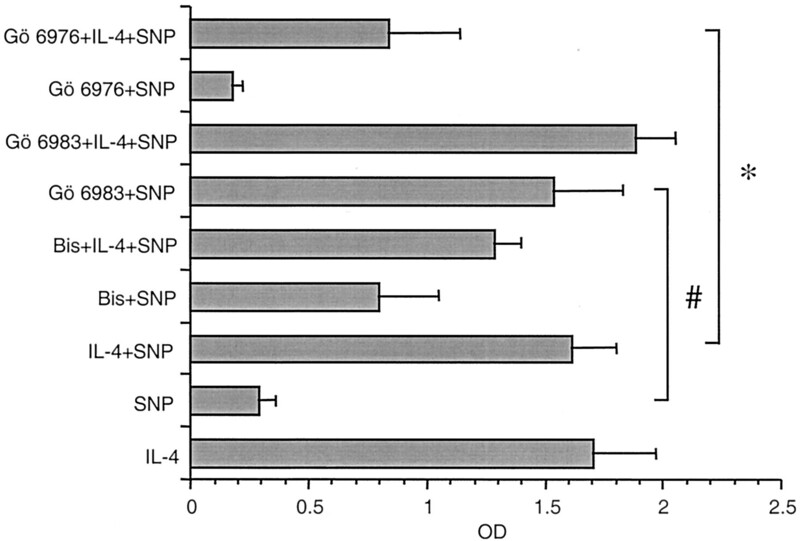 ∗, p < 0.01; ∗∗, p < 0.005 as compared with SNP-treated groups in absence of IL-4, IL-10, or IL-13. To further document the effects of IL-4 and IL-13, experiments were also performed on synovial explants, obtained during joint replacement. Explants were cultured for 2 days in the presence or absence of IL-4 or IL-13, followed by 24-h SNP treatment. Apoptosis was analyzed and quantified by 32P Klenow end labeling of total DNA separated on conventional agarose gel. We have developed this simple apoptosis test after having observed, in isolated human synoviocytes, a correlation between apoptosis and intensity of Klenow end-labeled HMW DNA fractions, able to migrate into agarose gel (Fig. 6⇓A). Radioactive labeling of total DNA by Klenow revealed two bands marked as “HMW DNA” and “23 kb” correlating with the degree of apoptosis (Fig. 6⇓A). Analysis of both signal intensities by phosphor imager showed that correlation with the level of apoptosis was better for the HMW DNA (Fig. 6⇓B), which was therefore used for quantification in subsequent experiments. Using this method, the densitometric analysis of HMW DNA (Fig. 6⇓C) from synovial explants treated with IL-4 or IL-13 before SNP exposure indicated that protective effects of IL-4 and IL-13 were 88% and 33%, respectively (Fig. 6⇓D). Gel electrophoresis of 32P Klenow end-labeled genomic DNA of human isolated synoviocytes (A and B) and synovial explants (C and D). Isolated human OA synoviocytes (passage 4) and human synovial explants, pretreated or not with IL-4 or IL-13 (50 ng/ml) for 48 h, were exposed to SNP (0.25–2 mM for isolated synoviocytes and 2 mM for synovial explants) for 24 h. Cells were collected, and total DNA was isolated and labeled, as described in Materials and Methods. 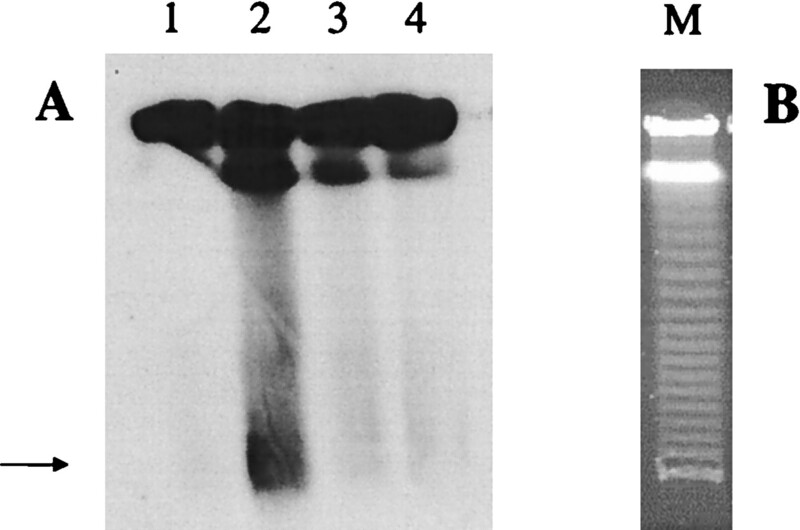 DNA fragments were separated by conventional agarose gel electrophoresis. A, Radiography of dried gel after Klenow end labeling of genomic DNA from human synoviocytes: M, HindIII cut λ DNA; line 1, control; line 2, 0.25 mM SNP; line 3, 0.5 mM SNP; line 4, 1 mM SNP; line 5, 1.5 mM SNP; line 6, 2 mM SNP. HMW DNA is shown by the arrow. B, Signal density values of labeled HMW DNA, shown in A, scanned by phosphor imager, and expressed in arbitrary units. The figures are representative of two experiments. C, Radiography of dried gel, showing the region of HMW DNA from human synovial explants. Line 1, Control; line 2, IL-4 + SNP; line 3, IL-13 + SNP; line 4, SNP. B, Signal density values of HMW DNA shown in C scanned by phosphor imager and expressed in arbitrary units. The experiment was performed three times (two with synovial explants from OA patients (presented) and one with a normal synovial explant, with consistent results). Because IL-4 was shown to exhibit its antiapoptotic effect, at least in part through the insulin receptor substrate (IRS) pathway (11), the effect of the phoshatidylinositol-3 kinase (PI-3-K) inhibitors wortmannin and LY294002 was tested by concomitant addition during IL pretreatment. LY294002 markedly decreased IL-4 and IL-13 protective effects (Fig. 7⇓, A and B, respectively). Similar effects for both cytokines were observed for wortmannin, at the concentrations 10–1000 nM (data not shown). Furthermore, addition of IGF-1, which uses the IRS pathway, significantly, increased cell survival during IL-4 or IL-13 pretreatment (p = 0.0163 and p = 0.009, respectively) (Fig. 8⇓). These results contribute to indicate that, in human synoviocytes, as previously shown for other cell types (11), antiapoptotic effect of IL-4 involves the IRS pathway. Effects of the PI-3-K inhibitor LY294002 on the antiapoptotic activity of IL-4 and IL-13. Human OA synoviocytes, passage 3, were pretreated for 48 h with IL-4 (5 ng/ml; A) or IL-13 (50 ng/ml; B), in the presence of 0.5, 2.5, and 5 μM LY294002; SNP (2 mM) was then added for an additional 24 h. Following the SNP treatment, cells were fixed, and the percentage of nonapoptotic cells was quantified by microscopy. Values correspond to duplicate cultures, each evaluated in five different microscopic fields, and the error bars to the SDs. Results are representative of two experiments. ∗, p < 0.01 as compared with respective IL-4 + SNP- or IL-13 + SNP-treated groups in absence of LY294002. Effects of IGF-1 on antiapoptotic activities of IL-4 and IL-13. Human normal synoviocytes, passage 2, were pretreated for 48 h with IL-4 (5 ng/ml) or IL-13 (10 ng/ml), in the presence or absence of IGF-1 (10 ng/ml); SNP was then added for an additional 24 h. Following the SNP treatment, cells were fixed, and the percentage of nonapoptotic cells was quantified by microscopy. Values correspond to duplicate cultures, each evaluated in five different microscopic fields, and the error bars to the SDs. The figure is representative of two experiments (OA and normal synoviocytes, with consistent results). ∗, p < 0.05 as compared with respective IL-4 + SNP- or IL-13 + SNP-treated groups in absence of IGF-1. PKCs represent one of the potential IRS-dependent or independent pathways of IL-4 antiapoptotic signaling. We therefore tested the effects of different PKC inhibitors on the protective effects of IL-4. We used Gö6976 which inhibits PKC α, β1, μ, Gö6983 which inhibits PKC α, β, γ, δ, and bisindolylmaleimide I which inhibits PKC α, β1, δ, ε. Gö 6976 significantly diminished the antiapoptotic effect of IL-4 (p = 0.049) (Fig. 9⇓), while Gö 6983 and bisindolylmaleimide I had no significant effects. Taken together, these differential effects of the PKC inhibitors suggest an involvement of PKCμ in the antiapoptotic effects of IL-4. Interestingly, pretreatment of synoviocytes with Gö 6983 (p = 0.049) and, to a lesser extent, bisindolylmaleimide I (not significant) had a consistent protective effect against SNP apoptosis, which suggests the involvement of PKCδ. None of the inhibitors used in these experiments affected the viability of the cells (data not shown). Effects of PKC inhibitors on cell survival conferred by IL-4. Human OA synoviocytes, passage 2, were pretreated for 48 h with IL-4 or/and PKC inhibitors bisindolylmaleimide (Bis) I, Gö 6983, and Gö 6976 (6 μM); SNP (1 mM) was then added for an additional 24 h. Following the SNP treatment, MTS test was performed. Values correspond to the relative quantity (OD measured by spectrophotometry at 490 nm) of formazan produced in the triplicate culture supernatants, and error bars to the SDs. The figure is representative of five experiments (three with OA and two with RA synoviocytes, with consistent results). ∗, p < 0.05 as compared with IL-4 + SNP-treated groups in absence of Gö 6976; #, p < 0.05 as compared with SNP-treated groups. In this study, we establish that IL-4 and IL-13, but not IL-10, protect synovial cells from NO-induced apoptosis. NO-induced apoptosis of synoviocytes was characterized by typical chromatin condensation, annexin V binding, as well as HMW DNA fragmentation. HMW DNA fragmentation could be quantified by simple assay proposed in this study, based on 32P Klenow end labeling of isolated total DNA, followed by agarose gel electrophoresis. This assay is particularly convenient in that it allows easy quantification of apoptosis in tissues such as synovial explants. Antiapoptotic activities of IL-4 and IL-13 were sensitive to both PI-3-K and PKC inhibitors, suggesting involvement of IRS and PKC pathways, respectively. These results demonstrate an antiapoptotic effect of IL-4 on synovial cells, which may contribute to modulate cell survival in vivo. IL-4, which opposes several effects of IL-1 and TNF-α on synoviocytes, is contemplated for the treatment of RA and/or OA. However, the fact that beneficial effects of IL-4 on cartilage destruction in animal models of RA are not accompanied by suppressive effects on synovial hyperplasia have led to question its use in gene therapy (6, 7). Misbalance between synovial proliferation and low frequency of apoptosis is considered a critical event in RA (22). Apoptosis of synoviocytes can be induced by NO donors (13), c-Myc antisense oligodeoxynucleotides (23), anti-Fas Abs (24), or apoptotic agents, such as verteporfin (25). Treatment with bisindolylmaleimide VIII, which facilitates Fas apoptosis, ameliorates symptoms in Lewis adjuvant arthritis (26). In contrast, inactivation of the p53 tumor suppressor gene in synoviocytes was shown to prevent NO-induced apoptosis and to render the cells more invasive (10). Therefore, proteins having antiapoptotic activities could have a detrimental effect on disease, by favoring synovial expansion. Apart from antiapoptotic effects on isolated synoviocytes, we showed that IL-4 and IL-13 also protect cultured synovial explants from NO-induced apoptosis. These results suggest that besides beneficial effects on cartilage, exogenous IL-4 and IL-13 may promote hyperplasia of the synovium. In addition, these results indicate that endogenous IL-13 and, to a lesser extent, IL-4 could be partially responsible for synovial hyperplasia during pathophysiological processes in RA. IL-13 is consistently found in synovial fluids of patients suffering from RA (27), and 35% of RA patients have been shown to have abnormally high serum levels of IL-4 (28). Furthermore, the antiinflammatory and immunosuppressive effects of glucocorticoids are thought to be exerted, at least in part, by down-regulation of IL-4Rα (29). Human synoviocytes express IL-4Rα and IL-13Rα1, and overexpress IL-13Rα2, but not the common γ-chain of IL-2R (30). We show in this study that antiapoptotic activities of IL-4 can be down-regulated by the PI-3-K inhibitor, LY294002, and the selective PKC inhibitor, Gö6976. IRS-dependent pathway is known to be involved in the antiapoptotic signaling of IL-4Rα (11). The differential results obtained in this study with Gö6983, Gö6976, and bisindolylmaleimide I suggest that activation of PKCμ may be responsible for cell protection by IL-4. Recently, PKCμ expression was also found to be correlated with the proliferative state of murine keratinocytes and NIH3T3 fibroblasts (31). These results are also consistent with a recent study showing that inhibition of PKC with Gö6976 results in a significant increase of both caspase 3 and caspase 8 activity in anti-Fas-treated Jurkat cells (32). The partial protection from SNP-induced apoptosis by Gö6983 alone suggests the involvement of PKCδ. A recent report showed that rottlerin, a PKCδ inhibitor, prevented anti-Fas apoptosis in Jurkat cells (33). Preliminary results from our laboratory showed that SNP causes a modest but consistent induction of caspase 3 in synoviocytes, but not in IL-4-pretreated cells. Experiments are in progress to clarify the role of PKCs in caspase activation. In the light of our results and those of others, possible pathways implicated in IL-4/13 antiapoptotic effects are summarized in Fig. 10⇓. Possible IL-4R signal transduction pathways leading to protection from SNP-induced apoptosis in human synoviocytes. IL-4 and IL-13 binding to their receptor (IL-4Rα/IL-13Rα1) can result, as in other cell types, in phosphorylation of the Janus-family (JAK) tyrosine kinase, which in turn induces phosphorylation of the IRS-1/2. Phosphorylated IRS-1/2 can then interact with PI-3-K, leading to its own activation. Once activated, PI-3-K mediates phosphorylation of membrane lipids such as phosphatidylinositol (4.5) diphosphate (Ins(4,5) PO4), resulting in the rapid formation of phosphatidylinositol (3,4,5) triphosphate (Ins(3,4,5) PO4). Phosphoinositides can in turn activate a number of downstream kinases, including PKCs and Akt kinase (also named PKB) implicated in cell survival. This is consistent with the finding that PI-3-K inhibitors (LY 294002 and wortmannin) as well as PKC inhibitors (Gö 6976) inhibit IL-4-protective effects on SNP-induced apoptosis (see Discussion). Possible IRS-1/2-independent pathways involving PKCμ, as indicated by Gö 6976 inhibition, or other as yet unidentified signaling molecules may also contribute to IL-4/13R antiapoptotic effects. IL-13Rα2 has been suggested to be a decoy receptor for IL-13. This could contribute to the lower effects of IL-13 on SNP-induced apoptosis, as compared with IL-4. 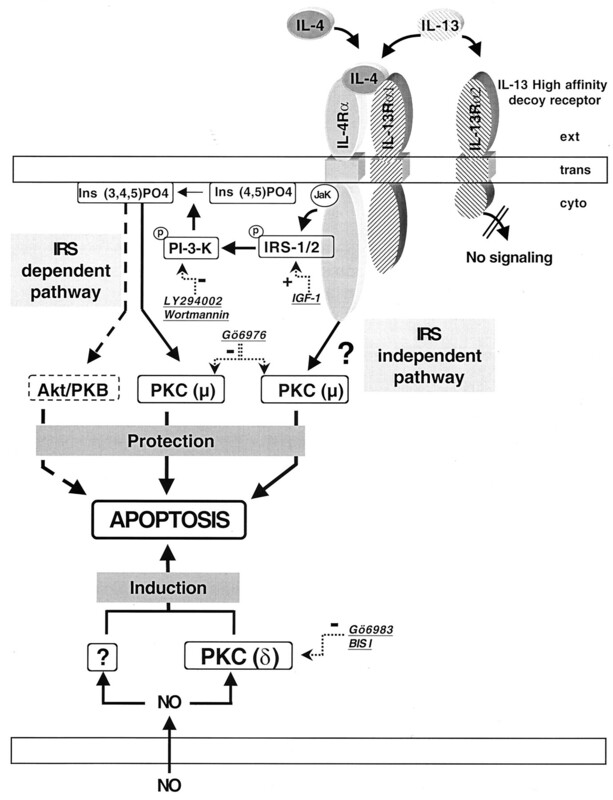 NO itself may induce apoptosis through a PKC δ pathway, as suggested by Gö 6983 and bisindolylmaleimide I (Bis I) inhibition, and most likely other as yet unidentified signaling pathways. Further dissection of IL-4Rα functions will tell whether antiapoptotic effects can be uncoupled from other effects of IL-4 and/or IL-13, which may be useful for new therapeutic approaches in RA and OA. We thank Jean-Louis Blouin for help with PFGE, Maria Olleros for help with MTS tests, Mirjana Andjelkovic for useful discussion, and Christian Vezin, Isabelle Viard, and Constance Barazzone for help with annexin V tests and useful discussions. ↵1 Supported by a Biomed 2 grant (BMH 4CT 961698) funded by the Office Fedéral de l’Education et de la Science (95.0349), and a grant (31-052719.97) from the Swiss National Science Foundation. ↵2 Current address: Department of Rheumatology, University Hospital Sart-Tilman, Liège, Belgium. ↵4 Abbreviations used in this paper: RA, rheumatoid arthritis; HMW, high m.w. ; IGF, insulin-like growth factor; IRS, insulin receptor substrate; MTS, 3-(4,5-dimethylthiazol-2-gl)-5-(3-carboxymethoxylphenyl)-2-(4-sulphophenyl-2H tetrazolium inner salt; OA, osteoarthritis; PFGE, pulse field gel electrophoresis; PI-3-K, phoshatidylinositol-3 kinase; PKC, protein kinase C; PS, phosphatidylserine; SNP, sodium-nitro-prusside.